CINCINNATI -- Call them the Team Fiona Tutu Squad. 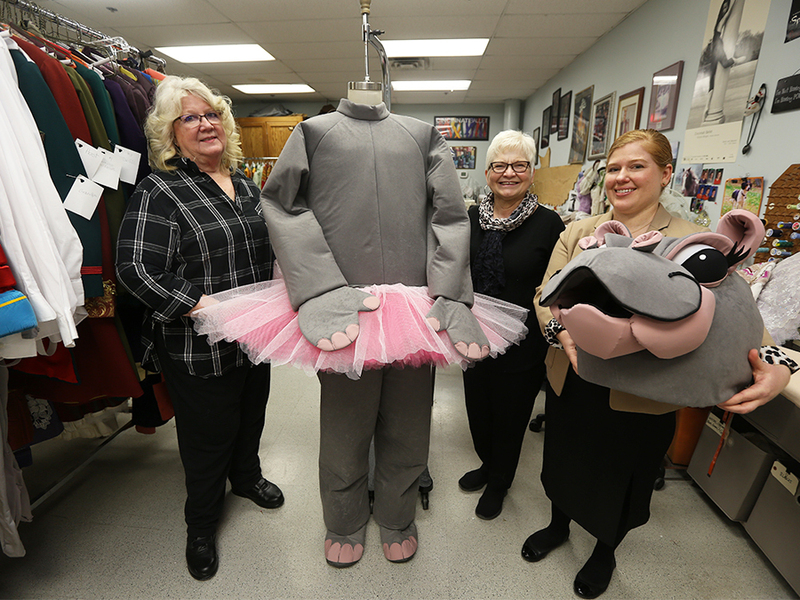 Wardrobe Mistress Diana Adams, second assistant to the wardrobe mistress Noelle Wedig and stitcher Jackie Andrews created a custom-made Fiona costume so everyone’s favorite baby hippo could be part of the Cincinnati Ballet’s production of "The Nutcracker" presented by Frisch’s Big Boy. It took them roughly 100 hours over four weeks to design and build the Fiona suit, which stands more than 6 feet tall and wears a handmade pink tutu with a 61-inch waist. Fiona, of course, is the baby hippo born six weeks premature at the Cincinnati Zoo & Botanical Garden. Her story of survival captured hearts around the world and made her the unofficial princess of the Queen City. WATCH: Go behind-the-scenes with the team behind the Fiona costume in the video above. The ballet’s production gives young dancers a chance to star in the "Nutcracker’s" featured roles of Clara and her brother, Fritz, along with dozens of other parts. The ballet decided Fiona, who will turn 2 in January, was old enough to audition this year. Adams said Fiona is among the most challenging costumes she has helped make in her 47 years with the ballet. The ballet and zoo hatched the idea to make Fiona part of the "Nutcracker’s" 45th season. Fiona’s head is the part of the costume designed to look most like her, rather than any random dancing hippo. Wedig, a Fiona fan from the start, created the head. She studied photos of Fiona’s face provided by the zoo’s marketing department and drew multiple sketches to try to capture the hippo superstar’s sass. The sketching was easier than translating Fiona’s personality into a three-dimensional sculpture that would need to fit comfortably onto a dancer’s head, she said. The finished head, complete with white sequin eye glimmers and long, girly lashes, weighs about as much as a football. It is sculpted around a helmet that rests on the head of the dancer, who can see by looking out of Fiona’s open mouth. Thomas Curran is the main dancer who will be playing Fiona; Michael Menghini also will play the role. Curran stands 6 feet, 2 inches tall and wears size 15 shoes so Adams’ team had to make sure the costume would fit him and could be adjusted for smaller dancers, too. The body part of the costume covers multiple layers of foam that the dancer will wear beneath the washable gray fabric so Fiona always looks fat and firm. 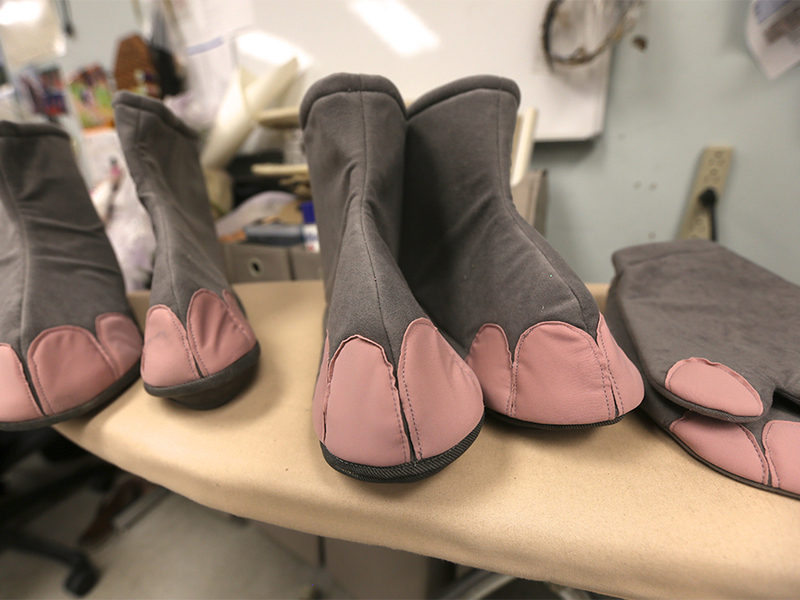 The gloves are removable and the feet rest atop the dancer’s toe shoes. All the hippo toenails are pink to match the hand-sewn, multi-layered tulle tutu that Adams made and the pink parts on her head. But no matter how the costume moves, the dancer will get hot inside of it as the Fiona character dances newly choreographed parts in both acts of the ballet. "The Nutcracker" presented by Frisch’s Big Boy returns to Music Hall from Dec. 13 through Dec. 24. This marks the production’s 45th season. More information about the show and a link to buy tickets are available online . Lucy May writes about the people, places and issues that define our region – to celebrate what makes the Tri-State great and shine a spotlight on issues we need to address. To read more stories by Lucy, go to www.wcpo.com/may . To reach her, email lucy.may@wcpo.com . Follow her on Twitter @LucyMayCincy.